A psychomanteum, is in a sense an adjunct to scrying (see post: Scrying). The psychomanteum is the mirrored room used by practitioners to contact the spirit world. 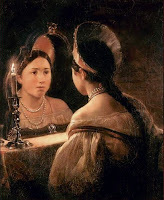 The practice of using a psychomanteum is often called 'mirror-gazing' and has been used in one form or another for thousands of years. A natural pool of water or water collected in a bowl, even the reflection of a pool of blood have been the mediums used for this practice. The psychomanteum has also been called the 'apparition booth', found at oracle sites in ancient Greece. One of the earliest sites of a psychomanteum has been discovered at Dodona in north-western Greece, a site famous for its oracles and one that probably pre-dated Zeus as the patriarchal god of the Greeks with the worship of the 'mother goddess'. Near-darkness, a flickering light and mirrors aim to place the practitioner into a trance-like state. 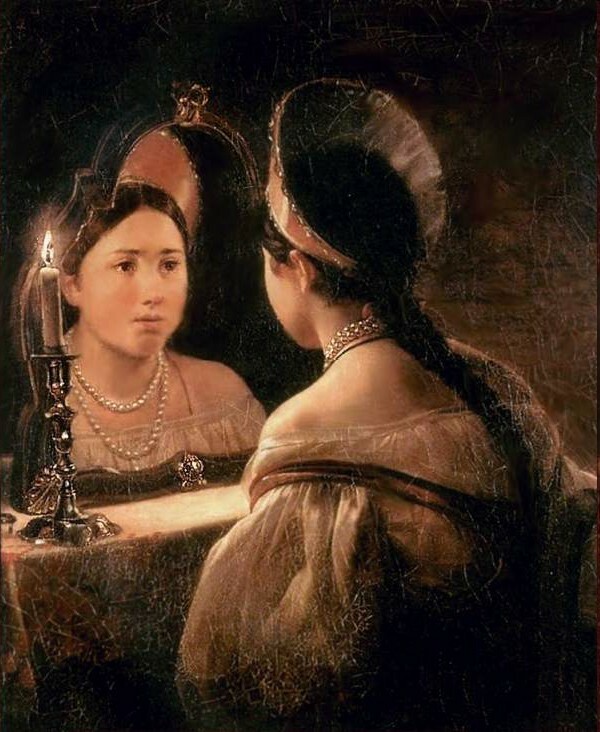 The lack of depth when gazing into a reflective surface, such as a mirror, decreases mental alertness, promotes relaxation and allows visions or hallucinations to be more easily induced. 'Catapromancy' was the term used to describe the use of mirrors for divination in ancient Rome and ancient Greece. There were even specialists in the priesthood of Rome who gazed into mirrors, known as the 'speculari'. But the use of a psychomanteum is not a phenomenon that died with ancient civilizations. The Ganzfeld Experiment (see post: Scrying) is a more modern technique that, in effect, creates an environment of sensory deprivation and has been used to investigate parapsychological phenomena. Several researchers, including those who examine near-death experiences (Dr. Raymond Moody) have used the psychomanteum as a tool to examine the 'para-normal' as well as altered states of consciousness (see post: Altered States of Consciousness). Is the use of a psychomanteum just another technique similar to others used in various societies to contact the dead? Does the altered state produced when using a psychomanteum give the practitioner the same experience as the Bwiti of Central Africa when they consume ibogaine and become the 'seers of the dead' (see post: A Drug to See the Dead)? For an interesting interview with Dr. Raymond Moody and 'near-death' experiences, click on the link below.